Living as I do across the river from the Royal Borough of Greenwich, I was alarmed this morning to find in my in box this poster, which is launched as part of a drive against domestic abuse. Alongside the poster runs the statement.. The Royal Borough’s Cabinet Member for Community Safety and Environment was joined by the Borough’s most senior police officer this week to launch the latest in a series of posters to highlight the campaign to tackle domestic violence and abuse. Councillor Jackie Smith and the Borough Commander, Chief Superintendent Helen Millichap officially launched the next phase of the publicity campaign which is aimed at highlighting the negative effects that domestic violence and abuse can have on young children. The main message is “You can’t hide domestic violence from children.” This challenges the idea often held by perpetrators or victims that as long as their children do not see the abuse taking place, they are protected from its impact. The truth is that children in abusive households can be seriously affected as they do hear the arguments and shouting. They will also witness or hear violence taking place, and will often even blame themselves for what is happening. Experiencing or witnessing domestic abuse as a child may lead to developmental, behavioural, emotional and social relationship issues which last well into adulthood. Children raised in abusive homes are also more likely to become abusers themselves, suffer from stress, depression and poor self-esteem and fall behind or drop out of school. All well and good, kids suffer when they hear violence and blame themselves for what is happening, nothing to argue with there. But that isn’t what this poster is saying is it? That is not its main message. The main message this poster conveys is that children are harmed by the violence which is perpetrated by their fathers. And as we know that a picture paints a thousand words, the image can only be designed with the purpose of reinforcing a stereotype which the Office for National Statistics figures confirm is a myth. This is the truth of violence in the home, plain and simple. These are not made up facts and they are not inflated, misrepresented or otherwise changed, twisted or tainted. This is the reality, taken from the Office for National Statistics in 2011/12. Out of every seven victims of domestic violence in the UK, four will be women and three will be men. Which means that unless all those men are not fathers and all those women are mothers, the reality of who is responsible for perpetrating violence in the home in front of children is far away from the stereotype of the violent father and much much closer to the reality that both men and women are actively violent in the home and that as mothers and fathers they are each capable of being violent in front of children. Imagine what those dads who have experienced violence at the hands of their partners in front of the children must feel like in Greenwich today. Invisible, invalidated, insecure? And imagine what those mothers who have perpetrated violence in the home in the Royal Borough of Greenwich must feel like on seeing these posters. Justified? Given permission? Encouraged? Violence in the home is damaging to children whether it is instigated by mothers or by fathers. Disempowering fathers by relying upon lazy stereotypes is an institutionalised abuse which is unjustified in today’s society. I hope that those who fight for the well being of men and boys in London and across the country will tackle the London Borough of Greenwich and the Metropolitan Police on their lack of gender awareness and their perpetuation of a stereotyped idea of who is violent in the home. Keeping our children safe by addressing the reality of what is happening in homes across the UK is an essential task of policing our country. Relying on stereotypes is not. As a footnote – on analysing the services provided in Greenwich for male victims of domestic violence, it is clear that these are provided in the same way as all gender blind services which do not take into account the reality of the different needs of men. Bolt on services for men, which are provided by a women’s housing charity is a fine example of institutionalised stereotyping and lazy service provision. It is also contrary to the Equality Act 2010, which you can be sure I will be quoting when I write to the Royal Borough of Greenwich Councillors and the Metropolitan Police today. I am outraged and disgusted by this poster beyond words! For what it is worth, I have already voiced my disgust with both the council and police. It gets even worse if you read the website. The ‘women’ section is much more in depth and sympathetic and links to all the issue that might impact ‘your’ children. In contrast, the ‘men’ section is brief without reference to children because obviously men have no substantial ties to them! Stop the madness! Can’t thank you enough for all you do! If you ever feel it is ungrateful work, just know that it is deeply appreciated by so many. Well spoken, Karen! I’ll be looking out for anything like this appearing in the West Midlands. Note the twisted ’empowerment’ message on the poster. 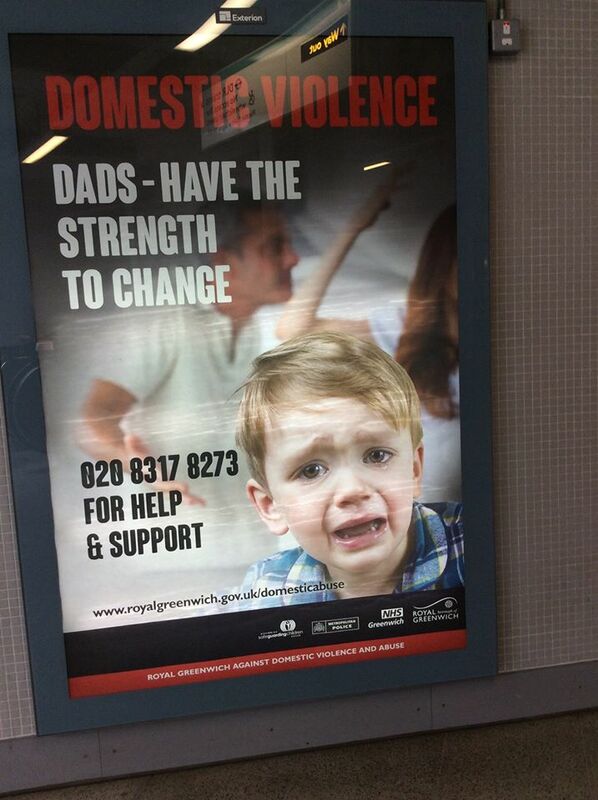 ‘Have the strength to change’ means, in this context, ‘Fathers, conform to lazy feminist stereotypes about men’. Is a violent father likely to be taken in by this? And, if he is, what kind of escape route from his state of mind could it possibly offer? Is it ‘lazy stereotyping’ or are the actions of Jackie Smith and Helen Millichap driven by misandry and self-interest? I doubt that they are unaware of the home office statistics, so I think that the fact is that they don’t give a damn about male victims and don’t want to acknowledge that they exist,because that might mean that they will have to put resources into supporting them. Karen, it’s not only in Greenwich. In the streets in Wood Green and in the waiting rooms at Haringey social services when I was there recently there were posters with a similar message: report male violence and abuse, on the lines of “if you don’t like what he’s saying or doing to you, talk to someone”. What about if it’s not your dad but your mum shouting at you and hitting you? I tried to photograph the posters but my camera wasn’t working at the time. Sorry! Maybe someone who reads this blog could go along to Haringey and snap them? Sorry to repeat myself but cafcass gave my violent ex wife CREDIT for the trauma of being arrested for DV after beating me up blood running down my face. This poster is obviously an outrage but just another indication of how stuck this society is in outdated gender stereotypes. It goes deep. Both ways…thanks! Karen, thank you for this article and your undertaking to write to Greenwich Council and the MPS Commissioner. Please let us know the responses you receive. “Have the strength to change” is a well known quote from The Godfather. Father/dad similarities not lost on me. Very poor taste. As usual total denial that the female of the species can be violent. I give up now the PC brigade in this country now few males as second class citizens ……. Jackie Smith ? That wouldnt be the Labour ex Home Secretary, feminist and shamed public fraudster who resigned after stealing from the public purse , would it? I have been fighting against this institutional anti dad discrimination since 2007 in Brent and Cafcass. Sadly it is not lazy stereotyping, it is systematic, institutional, well funded, highly organised, and historically comparable to the Jim Crow laws which were so biased against black people in the Southern states of America until 1967. For Jim Crow read Domestic Abuser, for black or coloured read Father or man. Until wider society principally men wake up and insist on equality for all it will continue and grow. Karen and Erin Pizzey are more than aware of the damage this discrimination does to children and society, their bravery stands out from the mediocrity and weasel speak of the myriad psuedo professionals including many Uncle Toms who are to willing to appease the stronger feminist elements who seek gender supremacy at whatever cost. Thank you Karen. Well written and informative. I appreciate all you are doing to bring this discrimination to light. Ironically , I came across this campaign whilst looking for resources or information that might help my Son who is facing false allegations of emotional abuse ( classed as Domestic Violence) by the Mother of his Son who is using it as a means of contesting contact with his Son in a Family Court Hearing. As a result of claiming to be a victim of Domestic Violence , the Mother then gets access to Legal Aid , whereas my Son on 14k pa cannot possibly afford a solicitor . Apparently , such allegations are routinely being made in the Family Courts by Mothers in dramatically increasing numbers. I wonder why? It is notoriously difficult to refute such allegations ( even more so without access to Legal Aid ). Even in cases were the allegations are proved unfounded there are no penalties suffered by the Mother for making such claims ( or indeed the Father if it was the other way round – but it isn’t) . I am outraged by the blatant , endemic and institutionalised discrimination faced by Fathers in seeking parental responsibility and contact with their children. Lesley, utmost sympathy. We have encountered almost exactly what you describe. It is impossible to deal with such corruption, especially on a budget of nil. It is the children who suffer most, and for all of their ruined lives, as well as fathers and their whole families.